Why did you decide to go on the Yanayacu Research Trip? I needed a senior research project and my professor was doing a project on medicinal properties of epiphytes. He couldn't do the trip so he asked us. What was the most important thing you learned? I learned a lot from Dr. Brown about Bromeliads. I like this kind of educational situation. It forced me to put myself out there. How has this experience changed you? Being in a different country changes you. We take so many things for granted, like buying a bottle of water. It has been eye opening. What are your plans for the future? I am going to Belize to take a tropical biology of Belize course. I want to go everywhere. 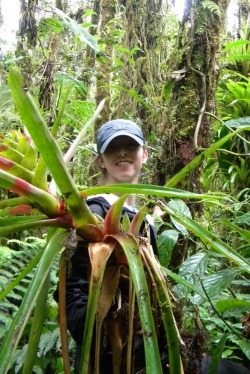 I want to set aside money to take more trips and continue working the Bromeliad project. What advice would you give a young scientist? Take as many opportunities as you can. Work in a lab, even if it is only washing dishes. Apply for as many scholarships and programs as you can.